This hunk of steel went way into the backing of my Cabela's fly reel and tested the Rulon disc drag. Drippy and dreary, yesterday’s weather front soaked the Rogue Valley with moisture. I watched the Rogue River water flow graph spike from 1360 CFS to over 2000 CFS. That left only one option for flyfishing for late April Rogue River steelhead and we set our sights and destination for the far upper river. I arrived and fished early without much happening. Chanced upon Will Johnson of the Ashland Fly Shop . Will was encouraging stating that he had hooked several fish in the lower water. A fine fly shop by the way, seldom lacking in anything one needs to buy. Check it out at theashlandflyshop.com. The water of the far upper Rogue River remain clear even in significent water fall. The rain continued cold and soaking until about mid-afternoon when the sun came out in fits and a small hatch of mayflies came off. 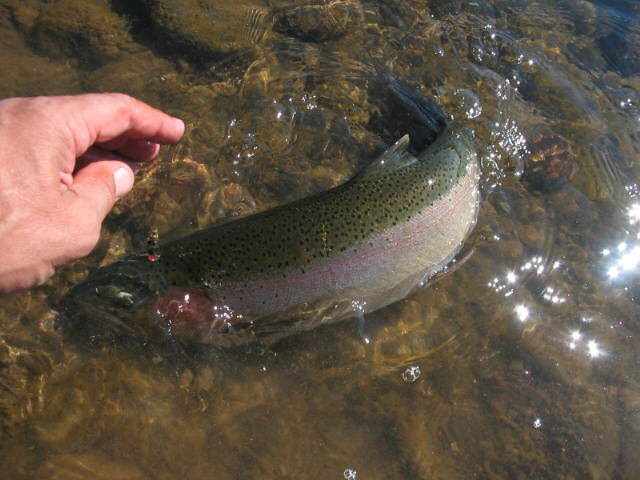 I’d hooked a heavy steelhead early, but the real action began then about 3:00 PM. 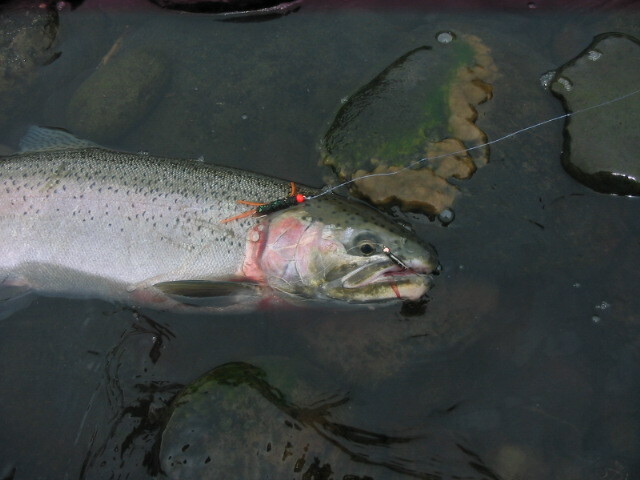 This steelhead took the Beadhead Steelhead Prince Nymph tied on a size 6 Dai-Riki #270 hook. The hatch brought considerable life to the cold, clear water. I watched the smaller trout and smolt make numerous rises. Then alongside a long, submerged log I saw a steelhead leap clear of the water. I changed up the flies of one of the rods for a Beadhead Steelhead Prince Nymph and a Salmonbagger Nymph with orange legs. 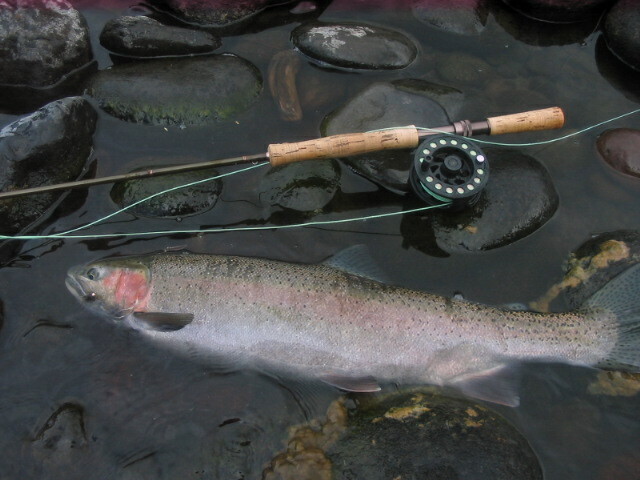 After several cast and drifts along the log, the line tighted and the above steelhead was on! She’d taken the Prince Nymph! This wild steelie took off like a Rogue River chinook. I certainly was relieved when she was finally landed for the photo. On my switch fly rod I continued casting my tried and true Carpetbagger and Beadhead G.R. Hare’s Ear Nymphs combination. For tradition and stick-to-it-ness I was duely rewarded. After the hook up on the G.R. Hare’s Ear the above fish took off like a Rogue River chinook. The first run ended in the backing and with an explosive leap. She definitely put on the “epic” battle of the winter for me. I eventually landed her about 100 yards downriver. We ended the day with two keepers for the larder. 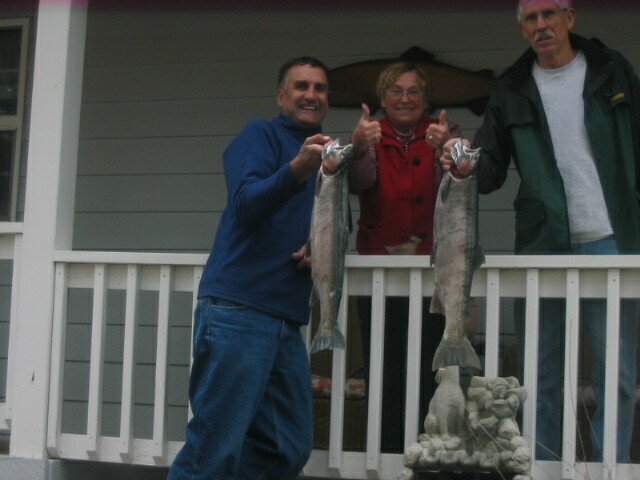 These fish were in very good shape and definitely will highlight Friday night’s fish fry! 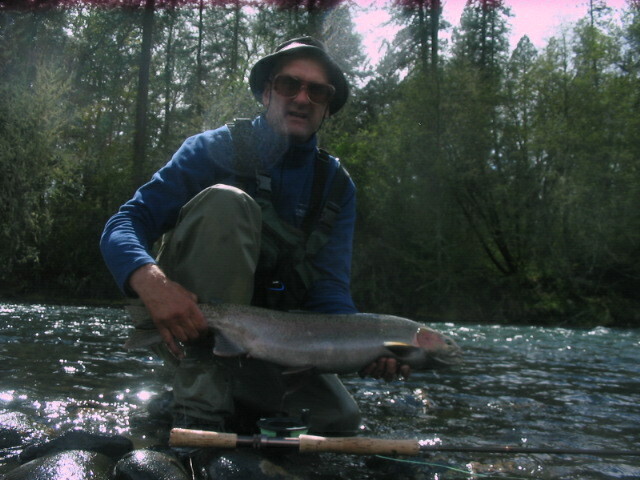 This entry was posted in Flyfishing, Flytying, Rogue River Report, Uncategorized and tagged anadromous fish, beadhead nymph, Carpetbagger nymph, cold water steelhead, Flyfishing, Flyfishing Guiding, G.R. Hare's Ear, Neil Selbicky, Oregon, Rogue river blog, Rogue River Chinook, rogue river fly fishing, rogue river guide, Rogue River Report, Rogue River Salmon Flies, Rogue River steelhead fishing, Rogue River steelhead flies, Rogue River water flow, Rogue River winter steelhead, Rogue Valley weather, Selbicky's Magic Fly. Bookmark the permalink.